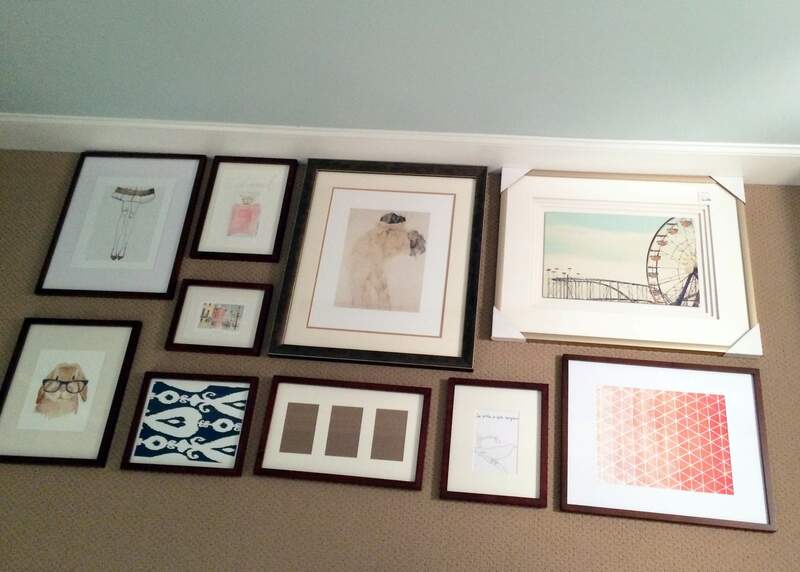 You are here: Home / Home Design / Create a Gallery Wall That Looks Like a Designer Did It! 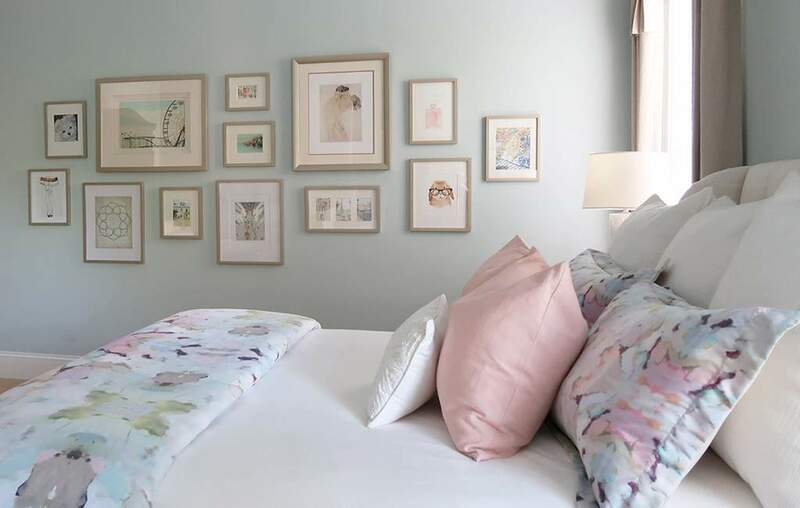 Create a Gallery Wall That Looks Like a Designer Did It! 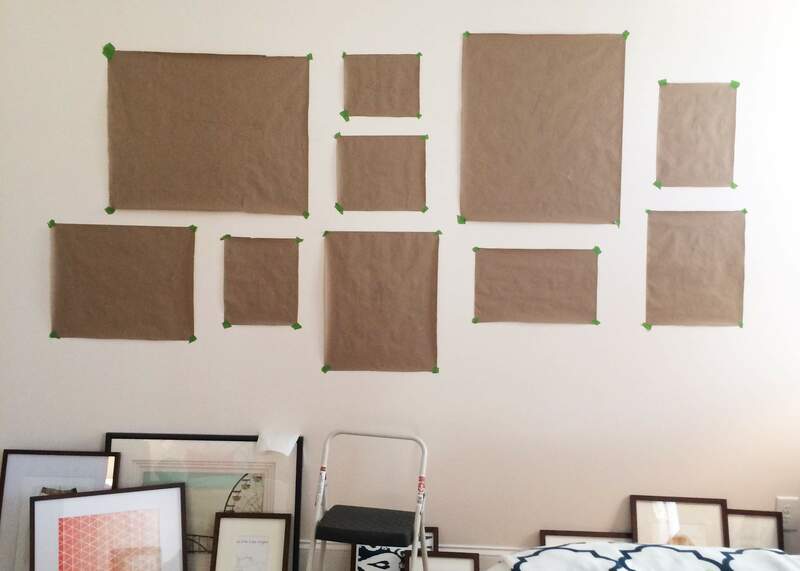 Have you struggled with how to even start the process of setting up your gallery wall? Does it seem too complicated? I have an easy formula! 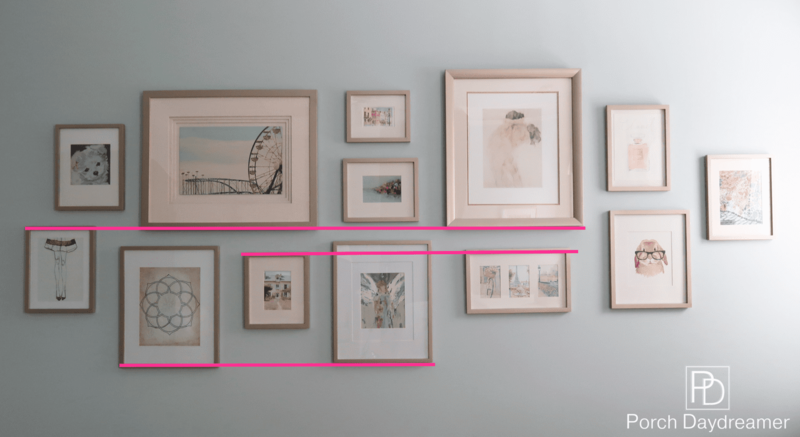 If you don’t have an interior design degree, but want your gallery wall to look like they do in magazines – I have the secret to success. There is one basic rule that works every time! Tracey, what does that mean? I’ll show you with my gallery wall! See what I mean? 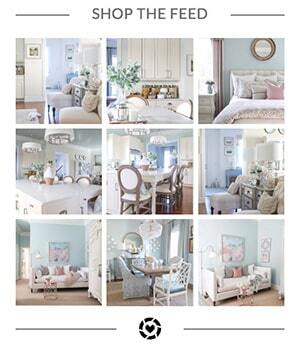 As you layout your items, place several at the same height using either the bottom or top of the frame. It provides an anchor for the art and the eye. Even though this group of artwork is different shapes and sizes there is a substantial foundation to it. My gallery wall has the lucky number 13! Think in 5, 7, 9, 11 depending on the size of the space you are trying to fill. If you don’t have an uneven number, then plan to add one object later and leave space for it at one of the ends. The picture below was the beginning of this gallery wall a few years ago and you can see my first instinct was to create a blocked symmetrical look. Instead after several layouts I ended up with an asymmetrical layout that I think visually looks more interesting. Plus I’ve been able to add artwork as the years have progressed, which would have been much harder to do in a blocked design. Layout all of your art or objects on the floor to determine the best design that works for you. This really is the hardest and most time consuming part because the options are infinite! 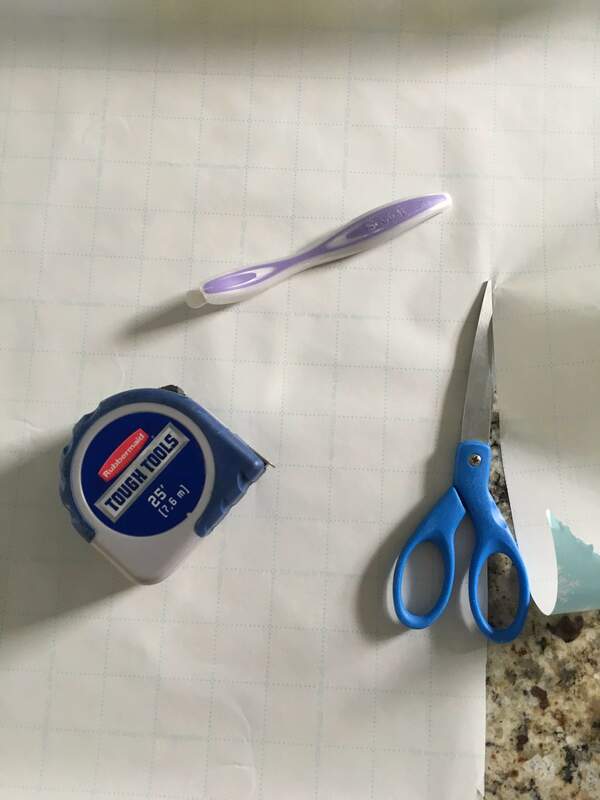 Trace each frame on either craft paper or wrapping paper with grid lines. The cutting grid guide lines on the back of the wrapping paper makes everything easier from tracing, to cutting, to locating where to nail in the picture hangers. I usually buy wrapping paper when it is on sale (most of the time standing in line at Home Goods!). Just check the label to make sure there is a cutting grid on the back. Layout the paper cut outs on the wall. 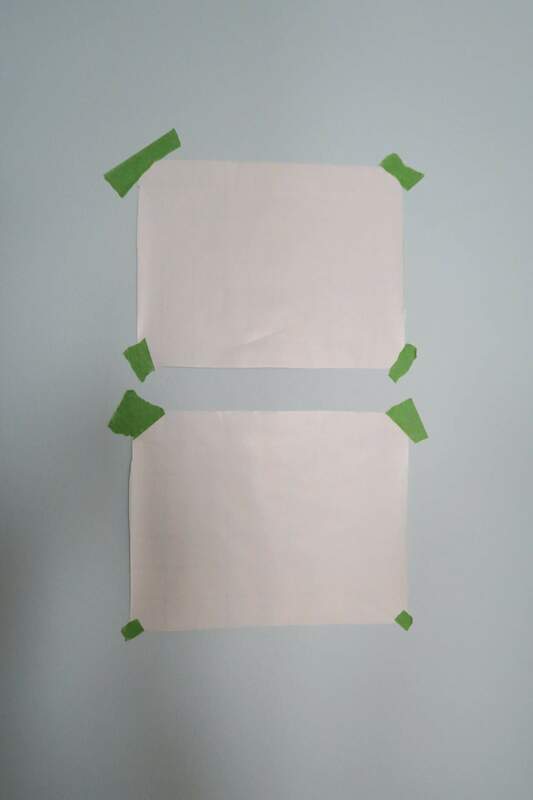 Use painter’s tape, so you can move the paper around easily without damaging the wall. Play with the design until you get it to “just about” where you want it. The beginning of this gallery wall started much smaller and with craft paper – I sure wish I would have thought to use the wrapping paper! You aren’t finished yet 🙂 Don’t be nailing holes in the wall…keep reading. Using a tape measure, measure between each item and make sure the spacing is similar. Most items in my gallery wall pieces are about 3 to 4 inches apart vertically and horizontally, but it’s a VERY large wall. Keep adjusting each item to get the spacing just where you want it. At the same time, check to make sure each piece is level. Have a picture hanging kit handy with a wide variety of sizes of picture hangers to make this job easier. 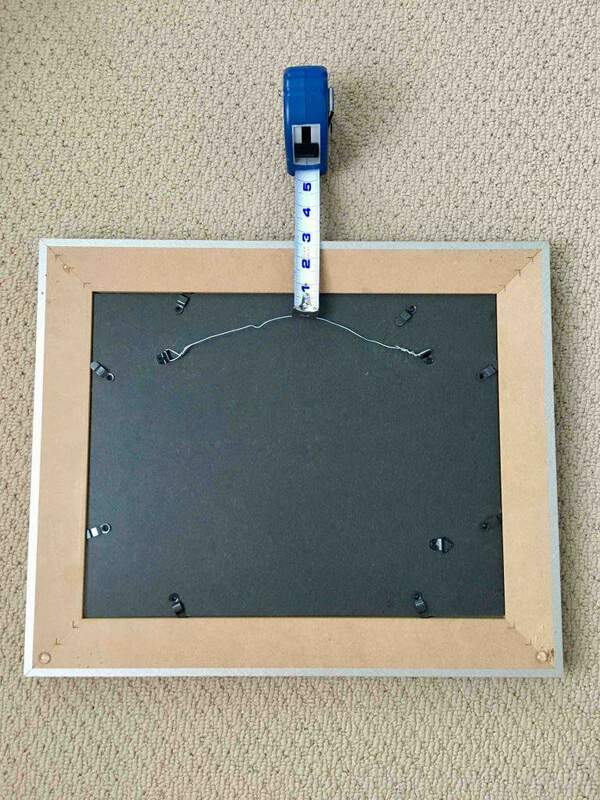 Then measure the back of the picture where the hanger is or pull up on the hanging wire to measure. I typically will use the measurement from the top of the frame. You need the center point and the distance down from the top of the frame. Measure in from one end and down from the top. Take those same measurements, map it out on the paper, and mark the spot with a pencil. Nail the hanger right through the paper. Hang up the artwork to test if it looks good. Make any adjustments and rip down the paper. Nice, right? Step back and admire your work. Be proud of your accomplishment! 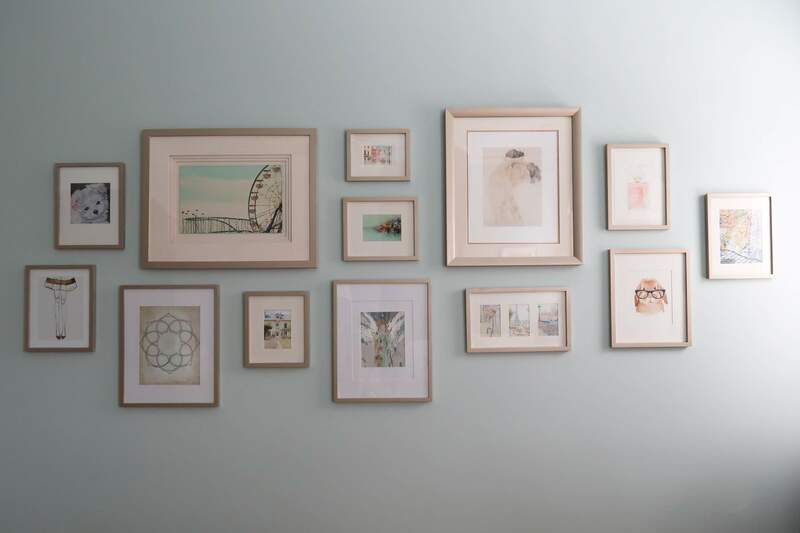 You just created a gallery wall that looks like you hired a designer to do it! The gallery wall in my bedroom makes me smile. I’ve filled it with images that are personal to me or inspire me plus added some of my own “artful” photography as well. It includes images of my favorite travel destinations, goals and even a lovely painting of my dog Mick as a puppy. Overtime I change it for my mood or life events. Two of my favorite places to find inexpensive art are Etsy and Minted. You can support a new artist along the way! Plus as you travel pick up post cards or take photography that can be framed. 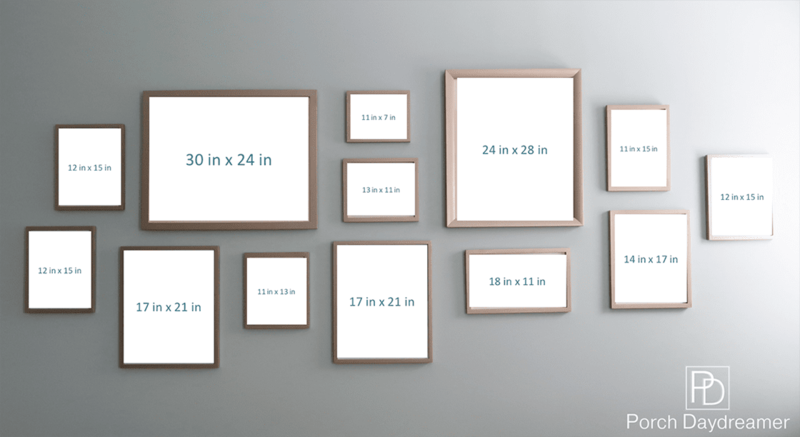 So you have perspective, I thought it would be fun to show you the exact frame sizes and measurements of my gallery wall. Then if you want to re-create the same look or portions of the wall you will know ahead of time exactly what to purchase. Or if you like you can purchase pre-made frame kits to get you started! Don’t forget mats! Mats are really what highlights the artwork itself and also creates a cohesive visual look. Most of the frames have them included, so not to worry! Happy hanging! CLICK HERE to see my post where I transformed my walnut frames to champagne gold easily and inexpensively. May I ask where you got the frames that were originally the espresso color? They look a bit like PB frames. Hey, Christina! Yes, there area few from PB and others I bought at Hobby Lobby or Frame it Easy. Hope that helps – didn’t want to spend the PB money to build the whole wall! 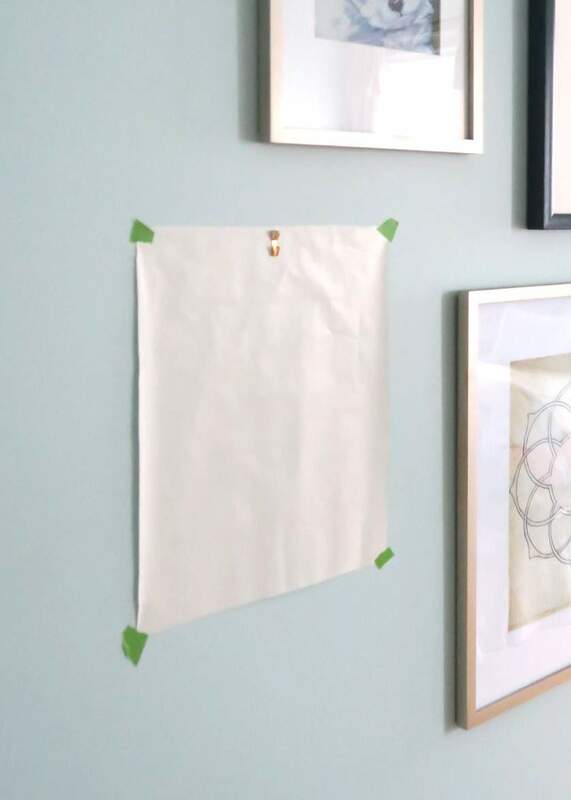 I love your gallery wall Thank you so much for the detailed instructions. I have been looking at so many gallery photo/art walls online but the difference with yours is that design edge. Just like you mentioned, it looks like a designer created it!!! Can I ask you how tall your wall is from floor to ceiling and what height from the ceiling is the picture that is closest to the ceiling if that makes sense? Hi! I’m so glad that you found my instructions helpful! My ceilings are 10 ft. tall and the crown moulding is about a foot deep. When I measure the “couple” piece of art from the top of the frame to the bottom of the crown moulding it is 28.5 inches. I looooove this! So helpful to know that the top and bottoms of frames should be level with one another. I’m really diggin your wall color! Can you tell me what color it is? Thank you and glad this was helpful! This wall color is so soothing. I’ve had it 7 years and redecorated 3 times around it. 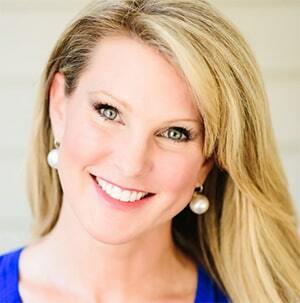 The blue acts like a neutral: LOWE’S/ Valspar Feeling Blue CI 13.